An application that queries or consumes descriptions of VO resources must be able to recognize a resource's support for standard IVOA protocols. This specification describes how to describe a services that supports four fundemental data access protocols--Simple Cone Search (SCS), Simple Image Access (SIA), Simple Spectral Access (SSA), Simple Line Access (SLA)--using the VOResource XML encoding standard. A key part of this specification is the set of VOResource XML extension schemas that define new metadata that are specific to those protocols. This document describes in particular rules for describing such services within the context of IVOA Registries and data discovery as well as the VO Stadard Interface (VOSI) and service self-description. In particular, this document spells out the essential mark-up needed to identify support for a standard protocol and the base URL required to access the interface that supports that protocol. It is important to note that the relevent behavioral differences between separate services that support a common protocol--and thus the metadata used to describe those behaviors--will be specific to that protocol. That is, the ability to create image cut-outs is irrelevent to the Simple Cone Search protocol. Consequently, it is necessary to define protocol-specific metadata to adequately describe a service's support for that protocol. This document defines such capability metadata for SCS, SIA, SSA, and SLA. This document describes, for each of the standard data access protocols--SCS, SIA, SSA, and SLA--precisely how to describe a service that supports one of the protocol using the VOResource XML encoding standard [VOR]. This specification is intended to be applicable whereever VOResource records are used, but in particular, it is intended as the standard for encoding resource descriptions within an IVOA-compliant registry [RI] and for encoding capability metadata available through the VO Standard Interface [VOSI]. Figure 1. SimpleDALExt in the IVOA Architecture. The Registry enables applications in the User Layer to discover archives in the Resource Layer and the services they provide for accessing data, particularly those that support the standard data access protocols like SIAP, SCS, SSAP, and SLAP (illustrated on the right). 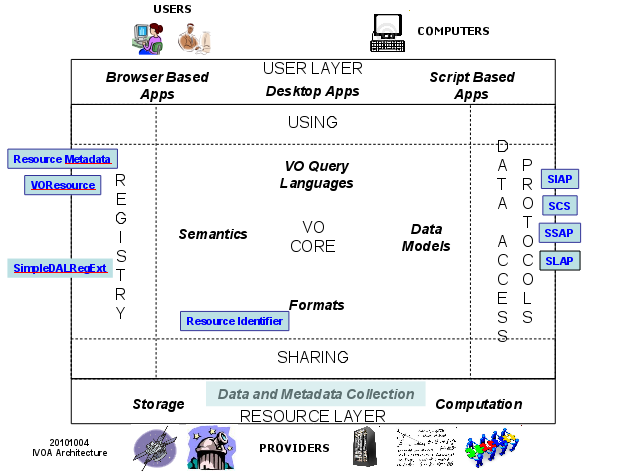 The registry metadata model standards (in blue text and boxes on the left) give structure to the information that enables that discovery. In particular, the SimpleDALExt standard defines the metadata used to describe standard data access services of the types listed on the right. Resource descriptions have a well-defined structure: the core concepts are defined in the Resource Metadata standard [RM], and the format is defined by the VOResource XML standard [VOR]. Additional metadata specialized to describe a specific kind of service are defined via extensions to the VOResource core XML Schema. SimpleDALExt is one such extension specifically for describing SCS, SIA, SSA, and SLA services in the registry. To be recognized as a service, the DAL service resource must be described as a resource type of vr:Service (defined in the VOResource schema [VOR]) or one of its legal sub-types. As specified in the VOResource specification [VOR], the resource type is set by setting the xsi:type attribute on the element representing the root of the VOResource record to the namespace-qualified resource type name. As the DAL services respond to queries with tables of available data products, the resource should set the resource type to vs:CatalogService (defined in the VODataService extension schema [VDS]. In this case, record authors are encouraged to include a full description of the columns in the table returned in query response (assuming full verbosity). The vs:CatalogService resource type also allows the record to provide sky coverage information which authors are also encouraged to provide; an exception to this would be for pure SLA services as the spectral line catalogs they serve are not strictly sky observations. The definition of the specialized vr:Capability sub-type fixes the value its standardID attribute to the URI that is intended to uniquely identify the standard DAL protocol whose support the type describes. The namespace associated with the ConeSearch extension schema is "http://www.ivoa.net/xml/ConeSearch/1.0". The namespace prefix, cs, should be used in applications where common use of prefixes improves interoperability (e.g. in the IVOA registries [RI]). Furthermore, we use the cs prefix in this document to refer to types defined as part of the ConeSearch extension schema. The custom metadata that the sia:ConeSearch type provides is given in the table below. For the elements whose semantics map directly to service profile metadata called for in the SCS standard [SCS, section 3], there is an entry labeled "SCS Name"; this indicates the metadata name given in the SCS specification that the element in this schema corresponds to. The profile metadata listed in the SCS specification that is not covered by the elements below are covered by other metadata that are part of the core VOResource schema. The <testQuery> element is intended to help other VO components (e.g. registries, validation services, services that monitor the VO's operational health--but typically not end users) test that the service is up and operating correctly. It provides a set of legal input parameters that should return a legal response that includes at least matched record. Since this query is intended for testing purposes, the size of the result set should be small. The namespace associated with the SIA extension schema is "http://www.ivoa.net/xml/SIA/1.0". The namespace prefix, sia, should be used in applications where common use of prefixes improves interoperability (e.g. in the IVOA registries [RI]). Furthermore, we use the sia prefix in this document to refer to types defined as part of the SIA extension schema. The sia:SIACapRestriction is defined to fix the value of the standardID attribute; thus, all uses of the sia:SimpleImageAccess type must set standardID to "ivo://ivoa.net/std/SIA". Because the cs:SIACapRestriction is marked as abstract, instance documents can not use it directly as a value for the xsi:type attribute. The sky coordinate axes may not particularly parallel with the image axes (e.g. due to rotation or projection effects); in this case, the longitudinal side should be considered the side of the image that it cuts the smallest angle with. The namespace associated with the SSA extension schema is "http://www.ivoa.net/xml/SSA/1.0". The namespace prefix, ssap, should be used in applications where common use of prefixes improves interoperability (e.g. in the IVOA registries [RI]). Furthermore, we use the ssap prefix in this document to refer to types defined as part of the SSA extension schema. Semantic Meaning: The largest search radius, in degrees, that will be accepted by the service without returning an error condition (as defined in [RM], section 5.2). Semantic Meaning: The hard limit on the largest number of records that the query operation will return in a single response (as defined in [RM], section 5.2). Use of this type is intended to be temporary: providers whose SSA service falls into this category are encouraged to up-date the service for compliance final SSA Recommendation. A VOResource resource description must not include both a ssap:SimpleSpectralAccess capability and a ssap:ProtoSpectralAccess capability that describe the same service base URL, as given by the <interface>'s <accessURL>. 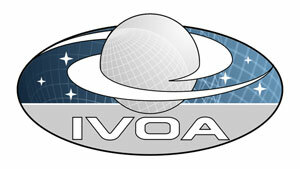 The namespace associated with the SLA extension schema is "http://www.ivoa.net/xml/SLAP/1.0". The namespace prefix, sia, should be used in applications where common use of prefixes improves interoperability (e.g. in the IVOA registries [RI]). Furthermore, we use the slap prefix in this document to refer to types defined as part of the SLA extension schema. Semantic Meaning: The hard limit on the largest number of records that the query operation will return in a single response. If not specified there is no predefined hard limit on the number of records in a query response. (entire sky) can be requested. the number of records in a query response.